I'm exploring African cooking/culinary videos on the Web. There's been quite a bit of positive buzz about Anthony Bourdain's recent show on No Reservations where he traveled to Ghana in West Africa to explore the food and culture there. It aired on the travel channel. While I've not yet seen the whole show, there's a nice brief clip from it on their website. Note the Star beer, the chichinga, the habanero peppers, the grilled tilapia, the banku . . . Yum. I can't wait until I visit again. He also has two clips shot in the southern African nation of Namibia. One of them is about eating oysters at a water-side restaurant, and the other is actually more about West/Central African cooking by a chef from Cameroon who has a restaurant in Namibia. Also, BlackTVOnline has a couple of 11-minute clips on YouTube by Ngozika, a Nigerian, demonstrating the preparation of a meat/spinach soup and pounded yam (a.k.a. 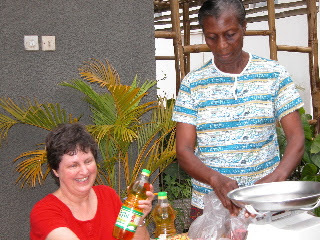 fufu) and the other preparing a corn porridge (pap, or akamu) and akara, a type of black-eyed pea fritter. It shows some cooking techniques, tools, and ingredients, but really needs to be supplemented by actual recipes (and some more explanation) for anyone new to West African cooking. Nigerian pounded yam is quite different from Ghanaian fufu. "Pepper" usually means the red chili peppers, not black peppercorns. I know many African countries have popular tv cooking shows (such as Asanka Delight in Ghana, and another one sponsored by Maggi in Nigeria, and Choumicha's popular show in Morocco). I believe Ghanaian-born Dorinda Hafner did a series of African cooking shows in Australia (are they available anywhere? ), and apparently Jeff Smith did a show called Dishes of Africa in 1992. I'd like to learn about more video/dvd resources if you know of any.